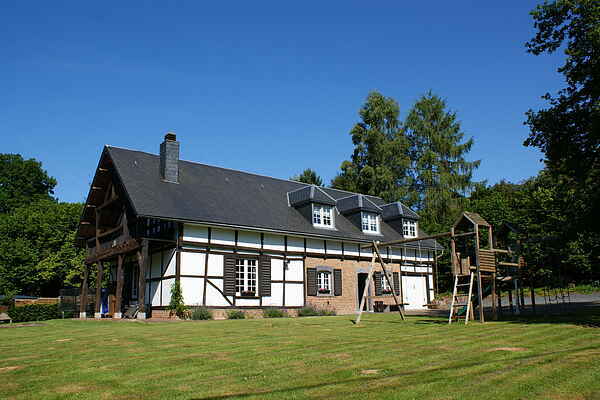 This charming timber framed home is situated on a dead end street in a quiet, green location. This rustically furnished holiday home is an ideal base for a family, whatever the season. In the summer children can play on the play equipment in the large garden. In the winter, after a day of skiing, you can fully relax in the whirlpool bath and sauna. In the evenings the whole family can enjoy the crackling fire in the cozy living room. This holiday home is aimed at families. This holiday home is a perfect base for going on day trips in the area. You are in fact in the heart of the touristic region of the Ardennes. For your daily groceries you can go to the lively Malmedy where you'll also find some excellent restaurants, good shops and cafés. At 5 kilometres you'll find the town of Stavelot with its abbey in which three museums are housed; certainly worth a visit. In the nature reserve the High Fens (23 km), where peace and quiet prevail, you can go for the most stunning walks. During the winter season the area offers skiing and cross country skiing opportunities in various places including Wanne (10 km) and Baraque de Fraiture (35 km).